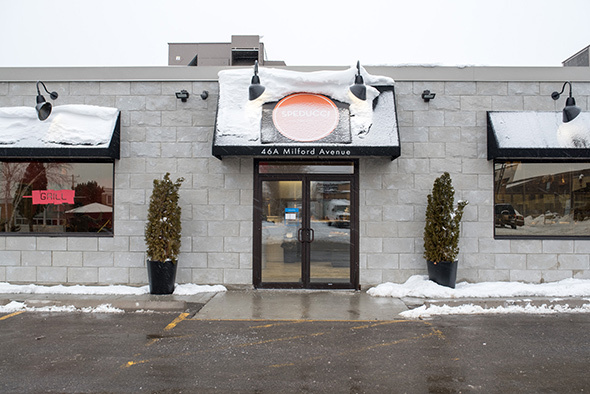 Speducci Mercatto is an Italian butcher, fine foods shop and cafe hidden away in an industrial area by Keele and Lawrence Ave W. that has been open for nearly a year now. It's a bright modern retail space with a cafe area on one side consisting of high top communal eating tables (one of which is filled with signatures of regulars and supporters written in black Sharpie). There are also private dining and event spaces off in a separate part of the building. The retail space sells a mix of made-in-house ready-to-go meals, Italian imports (olive oil, risotto, Rummo dried pasta, etc.) 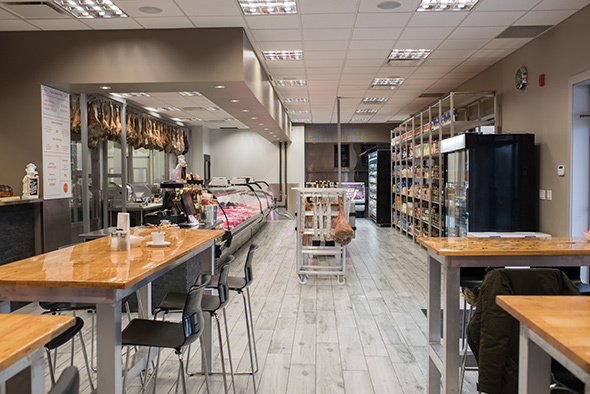 and butcher/deli counter offerings that include marinated, deboned and even risotto-stuffed oven-ready whole chickens, all kinds of sausages and of course, the cubed meat on a stick that the store is named after (also known as spiedini). 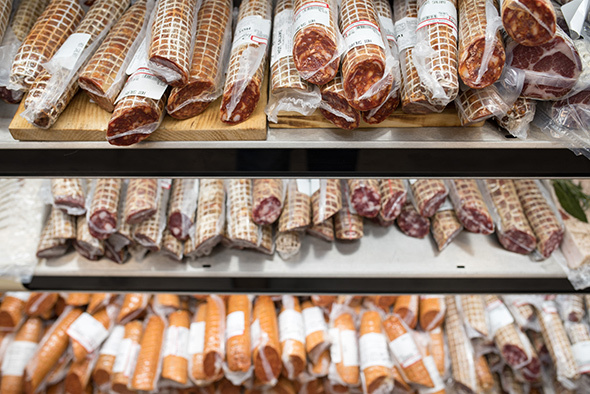 Then there are the cured meats. 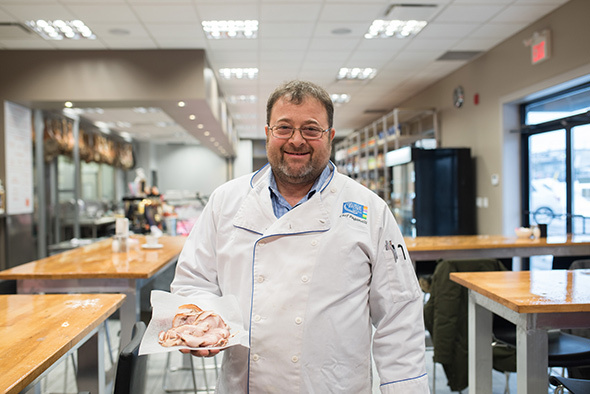 Owner Rosie Scavuzzo found her ideal business partner last year in Gabriele Paganelli, an Italian chef who moved to Canada over 20 years ago. He owned the resto Romagna Mia (now Paganelli's Risotteria ) and teaches cooking at George Brown College. 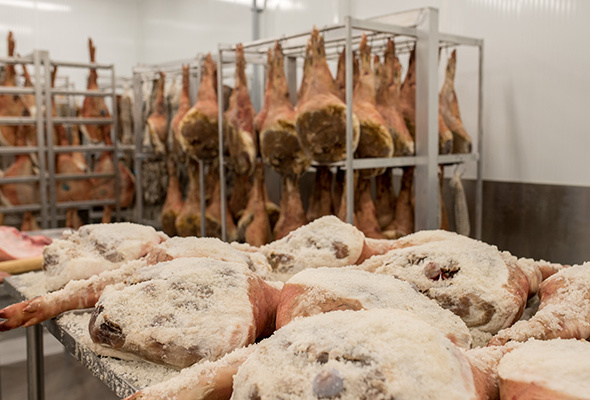 He also owns his own provincial plant where the speducci is made, and he cures all his own meats the old fashioned way - the way he learned to do it as a boy back in Ravenna, in the Emilia-Romagna region of Italy. 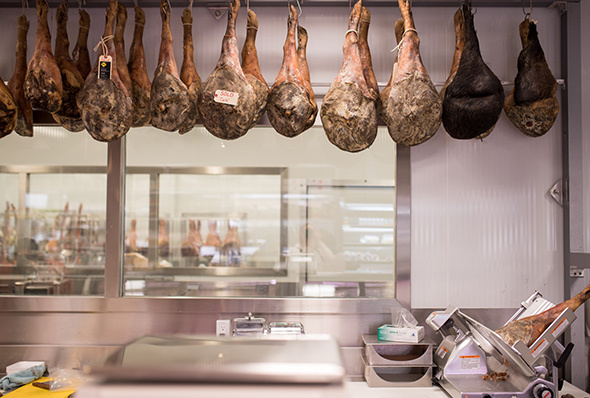 As soon as you enter Speducci, you'll immediately see a row of cured pork and wild boar legs hanging all along the back counter; Scavuzzo tells us you can purchase an entire leg ($32/kg) and leave it there - they'll tag it with your name (kind of like when you buy a bottle of sake at a Japanese izakaya) and slice off as much as you want each time you come in. 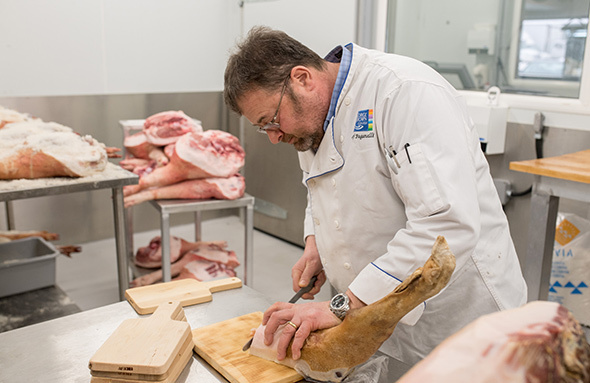 There's a showroom in the back, where Paganelli demonstrates how to cure the pork and wild boar meat (he has a farm where he raises his own wild boars; the Berkshire pork comes from a Mennonite farm outside of St. Jacobs) to make prosciutto, capocollo, pancetta, speck and salami (he also makes his own bresaola, which is cured beef). Paganelli is more than happy to explain the whole intricate curing process, which uses only natural ingredients like a special sea salt with an over-2,000-year-old history that's harvested by hand from the Adriatic Sea by a slow food movement co-op in Italy (it's naturally more sweet than other sea salts because it lacks the bitter minerals others contain) - but to be honest, we're more interested in eating. 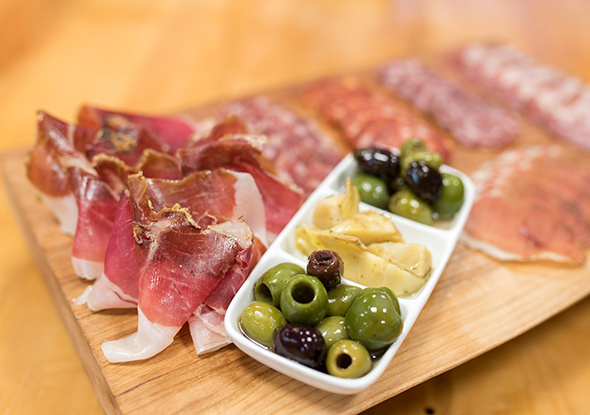 Salumi/salami boards ($15-50) can be created to the customer's liking, but the prosciutto is definitely a must. 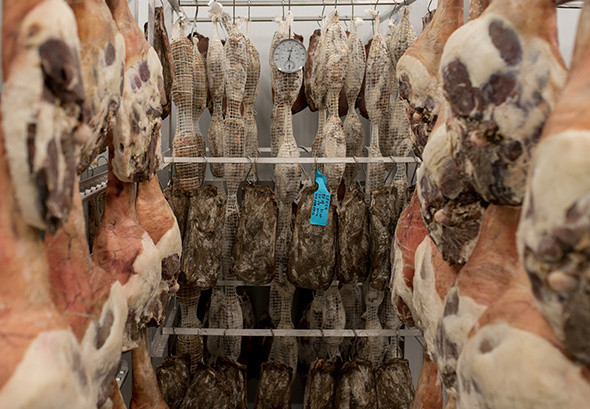 It's dry-aged in-house for 18 months, and it's a nice mix of saltiness and fat, while its texture is almost melt-in-mouth creamy. 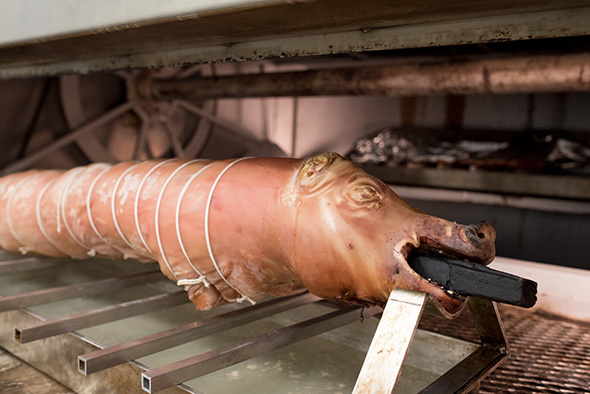 The wild boar prosciutto is leaner than the pork and has a slightly more game-y flavour. The cafe makes panini ($8 each, plus extra toppings 75 cents each), with the veal and porchetta being the most popular items so far. 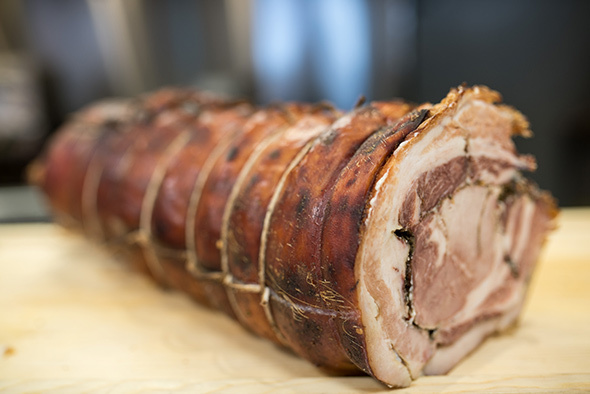 There are even all-you-can-eat porchetta Wednesdays ($12.99) where porchetta-lovers can get their fill of the tender, subtly seasoned pork roast that spends seven hours in the oven. 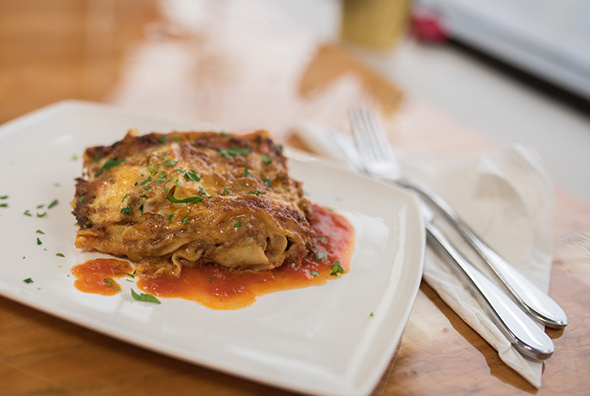 Bolognese-style lasagna ($9.99/lb) is a simple, classic dish that's hearty and comforting to eat. Scavuzzo tells me real Italian tomato sauce should not contain garlic (Americans added it in). This one doesn't, and I don't miss it. 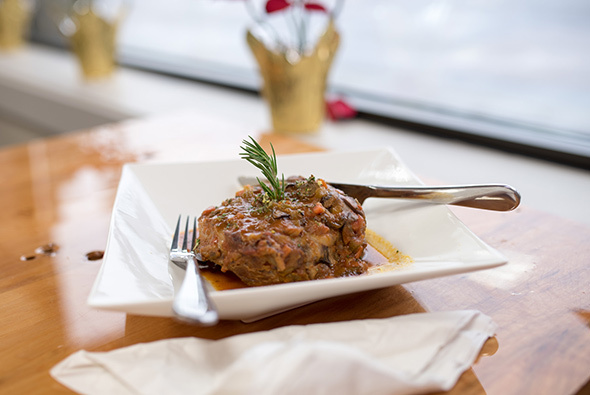 Another specialty is veal osso bucco ($14.99/lb), another Italian classic and the ultimate in comfort food. The meat falls off the bone, and the marrow - obviously the best part - is delicious. All the recipes are Paganelli's, who feels lucky to be from the Emilia-Romagna region (which Forbes claims has the best Italian cuisine). I ask Scavuzzo what her fave dish is. 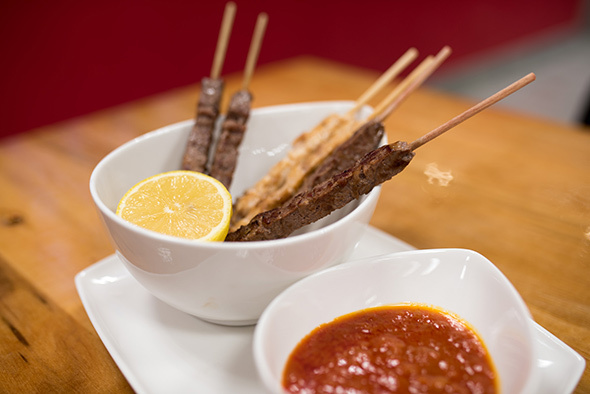 "My favourite dish is anything that he cooks," she says, gesturing towards Paganelli. Scavuzzo says they will cook practically anything they sell in the store on-site for customers if they're not in a rush, and conversely, if you like the food you eat in the cafe, you can also buy prepared versions to take home and cook yourself (individual-sized portions range from $7.50 to $25). She emphasizes that everything can be customized here. There are also plans to serve wine and beer after they acquire a liquor license in the next few months, and they are starting to host head-to-tail dinners and private tasting menus in their dining room. This is definitely a spot where you need to know where you're going to get here, but it's worth the effort to make the trip. It's certainly a fun place to grab a cappuccino, browse and eat some authentic Italian food.